To say that head injuries, specifically concussions, are more in the spotlight now than ever before, would be understating the obvious. With a number of retired National Football League (NFL) players coming forth since 2006, the subtle, yet substantial, effects of diagnosed concussions and “sub-concussive” head trauma have gained national attention. One the leader of this heightened awareness is Christopher Nowinski from Boston. Chris is a Harvard graduate, former Harvard football and former WWE professional wrestler. Looking back now, Chris realizes how many and how serious some of his “dings” throughout his career(s) actually were. His book, Head Games details the National Football League’s dealings and misdealings in the area of player safety as it relates to head trauma. The combination of the text and now film is perhaps the finest, most detailed and comprehensive regaling of the underbelly of this country’s most beloved sport. 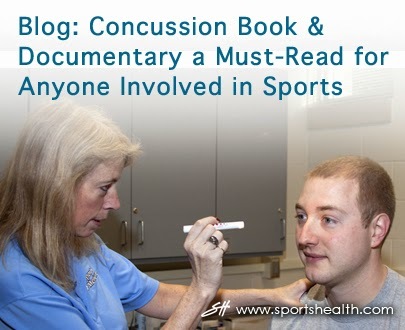 These are must reading and viewing by anyone associated with sports, not just football. The award-winning documentary is a feature length by an acclaimed director. It combines actual stories from players, surviving loved ones and some of this nation’s finest brain trauma experts. Dr. Ann McKee, MD, Dr. Robert Cantu, MD and Dr. Robert Stern, PhD - who are now known internationally for their work and examination of deceased brain tissue changes of former athletes from a variety of sports and age groups. As someone who played 4 years of high school and 4 years of college football, I identified with the stories. On one occasion I was knocked unconscious in college practice. It took me considerable time to remember the play I was carrying the ball on. I am glad now that I did not act upon the invitation letter to attend an NFL non-drafted player tryout. The film is an outstanding tutorial; it is not a condemnation of sports. It supports the inherent value of sports, overcoming obstacles, teamwork and life values. But all these objectives must be tempered with safety, rule changes, age-specific alterations and increased scrutiny of participants’ health. Several former professional athletes now must live their lives filled with mental and physical shortcomings. Several deceased athletes that we all loved to watch display their talents are believed to have succumbed to dementia, Alzheimer’s or depression. Chris’s involvement and narration on the documentary expertly delves into boxing, college football, girls’ soccer as well as professional ice hockey and football. These experts detail the need to decrease or eliminate the “military mentality of organized war with rules” that sports have so often become. Dr. Cantu, father of the first grading protocol for concussions, says that with the rise in sports participation every high school that offers a sports program should have a certified athletic trainer on staff. If not, then schools should not offer sports that give rise to concussive trauma. He goes on to state that the number of practices that allow head trauma should be reduced to reduce the incidences of “sub-concussive” head trauma. He points out that the NFL typically has only one practice day a week with contact. This five star detailing of accounts, history and real stories make the text and documentary film a requirement for every high school and college athletic department’s must read/view list.